Hailed as one of the highlights on the island’s calendar, Songkran in Koh Samui is marked with an unforgettable array of aquatic antics enjoyed by both locals and visitors alike. Songkran is the biggest and most memorable festival you’re ever likely to experience in Thailand, held in April, the month that marks the end of the Buddhist lunar cycle and therefore Thai New Year. Originally celebrated with locals splashing their loved ones to spread good fortune, Songkran in Koh Samui now includes more modern forms of revelry with visitors and locals alike gathering in the streets to soak one another with buckets of water, hose pipes, super soakers and more! The Songkran holiday usually runs over the weekend of April 12th-14th. In some parts of Thailand the water throwing lasts longer, but in Koh Samui the festival takes place over one weekend around this date, with locals enjoying a full weekend off work to take part in the shenanigans. Expect lots of water! Songkran takes place during the hottest time of the year, so the festival is a welcome way to cool down from the hot Samui sun. Visitors should attend the festival events armed with plenty of water-filled devices, from buckets and water balloons, to super soakers, water pistols and more. Typically crowds of people fill the local streets and soak one another in a water fight scenario. Others head to first floor windows of their apartment, hotel or Koh Samui villa to throw gallons of water on passers by. It may sound raucous, however the festival is enjoyed in the best of spirits with everyone except the police, monks and elderly joining in the fun. Where to go for Songkran in Koh Samui? Where to celebrate Songkran in Koh Samui depends on how involved you want to get. There are endless things to do across the island during Songkran, with something to suit every kind of traveller. Head to one of the many pool parties, street soakings or busy beaches if you’re up for a serious sopping. These may seem a little on the wild side however Songkran in Koh Samui is a lot more tame than Bangkok or any of the larger cities and islands. Head to Chaweng for foam parties, live DJ’s and large buzzing crowds. Nathon and Koh Samui’s west coast are much quieter, and offer a more authentic and gentle expression of Songkran. Choeng Mon and Maenam are both great options for families with children. While in Bophut and Fisherman’s Village you’ll find a great atmosphere offering a mixture of everything for everyone. Wherever you are in Koh Samui during Songkran you wont need to look very far to find the festival. We recommend staying off the roads and away from the boozy beach bars, with a good supply of dry towels within easy reach in our Koh Samui villas. Should I Visit Koh Samui During Songkran? Yes. 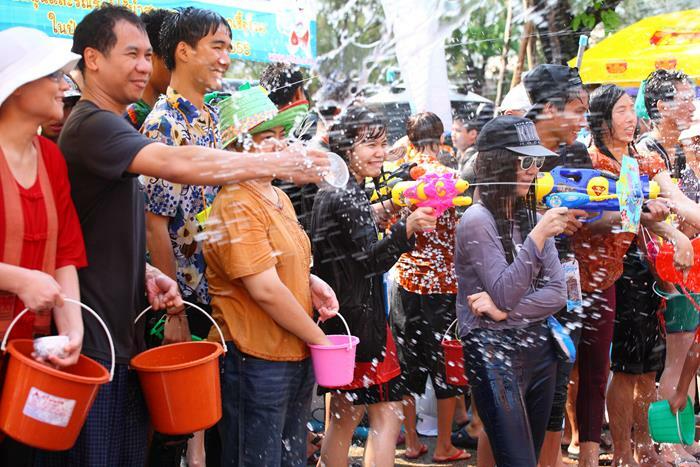 Songkran is one of the most fun-filled events you’re ever likely to experience in Thailand. It is an occasion where the whole community is united with well wishes and good cheer. Despite the hot weather, holidays to Koh Samui during Thai New Year are popular, with many visitors enjoying the cool water being thrown around in abundance. If you are thinking of booking a vacation to Koh Samui for Songkran then don’t hesitate. Any visit that coincides with Thai New Year is a great chance to experience Thailand at its very best.